In the article on the sound physics, we talked about how sound sources create and transmit vibration at given frequencies and intensities through a medium. Special hairs in the ear then change the vibration into electrical signals in the brain, causing the perception of sound by the listener. A speaker is just one example of a sound source, and this article will cover the science and theory behind how speakers work to make sound. The modern-day dynamic loudspeaker is an ingenious feat of engineering. British physicist Oliver Lodge invented it in 1898 and two Americans named Edward W. Kellog and Richard W. Rice then patented it in 1925. These early loudspeakers were designed slightly differently than the ones we have today. 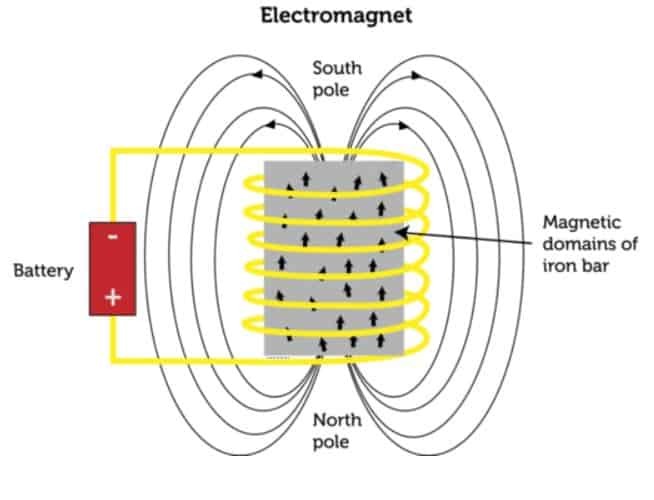 They used two electromagnets instead of permanent magnets commonly seen in modern speakers due to the costliness of permanent magnets at the time. We’ll soon see that magnets are just one of a couple different key components that all work together to create sound. We’ll need a basic understanding of electromagnetism and electricity to understand how all these parts work together to create sound. Faraday’s law of induction is a physical law that says when electricity flows through a wire, it creates a magnetic field with field lines that circle the wire. When we wind the wire into a coil (like the voice coil in a speaker) and send electricity through the coil, the resulting magnetic field acts like a magnet with two opposite poles. We call this an electromagnet. The strength of the electromagnet is proportional to the electrical power flowing through the coil. Sometimes, the manufacturer adds an iron core to the center of the coil to further strengthen the electromagnet. Alternating current is a form of electricity where the current periodically reverses its direction. 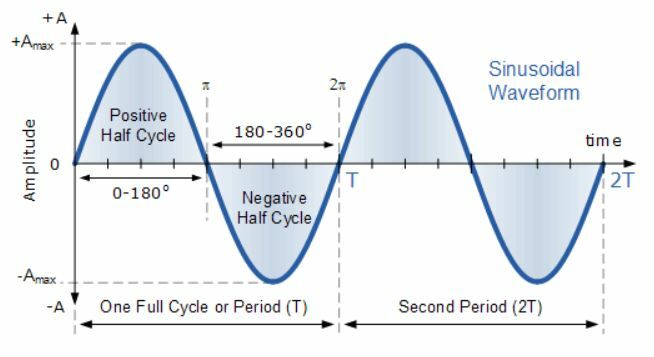 We can represent an AC electrical signal with a sinusoidal waveform. The waveform has a frequency in Hz and an amplitude, just like with sound waves. The frequency is just the number of full wave cycles (one peak and one valley) per second. Most of us know that when two magnets come close together, they will want to move. Opposite poles attract and the same poles repel. A speaker creates movement by manipulating the interactions between an electromagnet (the voice coil) and a permanent magnet. The voice coil is suspended in the magnetic field of the doughnut-shaped permanent magnet. When we have no electricity flowing through the voice coil, we have no electromagnetic field being generated. Therefore, no interaction or movement will place. When we do have electricity flowing, we generate an electromagnetic field. Then, the poles of the electromagnet and permanent magnet interact with each other and cause the suspended voice coil to move. We can control the strength of the electromagnet and therefore the amount the voice coil moves by controlling the electrical power flowing through the voice coil. The greater the electrical power, the greater the displacement of the voice coil from its de-energized equilibrium position will be. The power is directly related to the signal amplitude. A higher amplitude means higher power and more sound! We can also control the frequency of the voice coil’s movement. When using an AC electrical signal to energize the voice coil, the poles of the electromagnetic field will flip positions. As the poles switch, it changes the way the voice coil interacts with the permanent magnet. It forces the voice coil to move back and forth in an oscillatory manner at the same frequency as the AC signal. Take another look at the diagram. 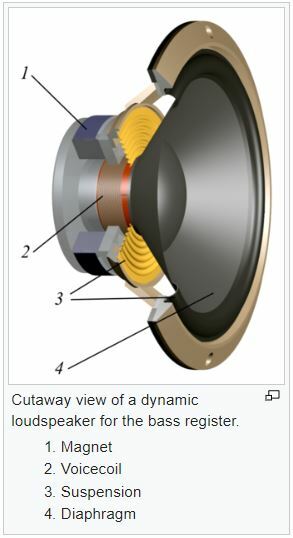 The voice coil is attached directly to the diaphragm/cone. So, by controlling the amount and frequency of the voice coils motion, we are also controlling the motion of the cone. As it vibrates, the cone pushes air and creates pressure waves with same frequency as the AC electrical signal being sent to the speaker. These pressure waves in the air are also known as sound. DAWs (digital audio workstations) such as FL Studio, Ableton, Reaper, Cubase, ProTools, and many others are basically software packages that can transform your musical idea into an AC electrical signal. The signal tells the speaker how to move and behave to create music that can make people dance, sing, cry, or yell. A pretty awesome concept, and borderline sorcery if you ask me.